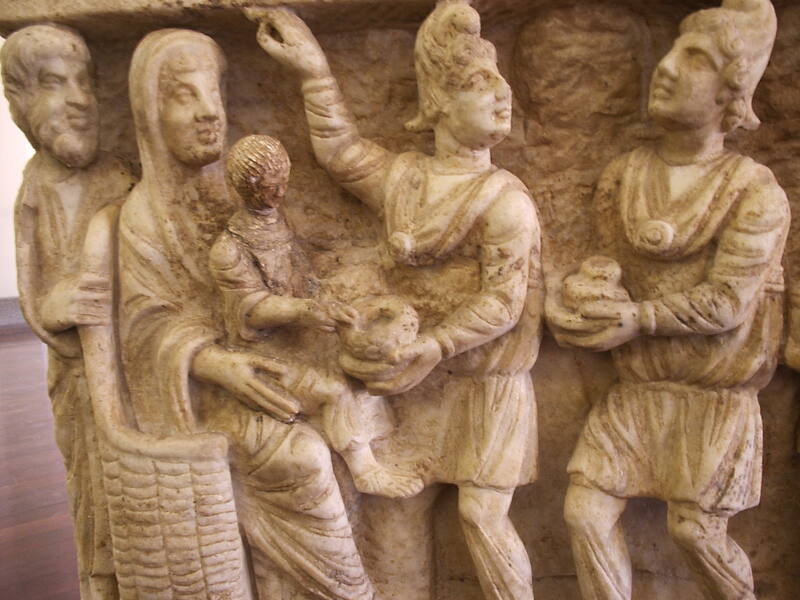 Early Christian art depicting the Magi. a sermon preached by the Rev. Abigail G. Henderson at First Congregational Church of Minnesota, UCC, on Jan. 2, 2011. It came from a friend who was getting married the very next day. The bride, my friend, was raised Catholic and practices Buddhist meditation. The groom hails from India and regularly worships at a Hindu temple. Given their diverse spiritual beliefs and practices, the couple chose the neutral space of the county courthouse for their ceremony. They asked me to write a blessing for their marriage that would incorporate their different backgrounds and shared values. Earlier on, my friend had asked me if I felt comfortable performing a Christian-Hindu fusion blessing. I said, of course. I admitted my limited knowledge of Hinduism, but said, if the couple was willing to help me with the words, I would be most honored to deliver them. That’s how epiphanies seem to work—they occur like a thunderbolt, but once they have manifested, they seem so obvious and right. Why didn’t we think of that before? And so, the next morning, at the courthouse, we honored the mighty Mississippi—as well as the God of Light, the Spirit of Love, and the Hindu Gods Ganesh, Shiva, Brahma, Krishna, Muruga & Devi. It is intriguing timing that my friend’s “midnight epiphany” would coincide so closely with the Christian festival of Epiphany, traditionally celebrated on January 6. Epiphany doesn’t mean quite the same thing in these two contexts. In every conversation, epiphany means an appearance or a revelation—a sudden insight. In Western churches, the Epiphany commemorates the coming of the wise men bringing gifts to visit the Christ child, whom they recognized as God Incarnate. The Magi were thought to be Persian astrologers, and their worship of Jesus corresponds to Simeon’s promise that this child would be “a light for revelation to the Gentiles.” We’re not a private revelation here—we’re talking about a corporate insight, a global insight. The Word was coming into the World—was in the world—and though the world was made through the Word, the world didn’t recognize it… Yet any who did accept the Word, who believed in that Name, were empowered to become children of God—children born not of natural descent, nor urge of flesh, nor human will—but born of God. John tells a story of the Light that overcomes the deepest darkness. But it must be said, of course, that not everyone desires this Light, described this way. In our pluralistic, postmodern, rational society, how dare we claim that there is a “true light, that enlightens everyone”? We are all too aware of the dangers of religious intolerance and exclusivity. That’s a very vivid, fleshy sort of image, isn’t it? “Shoving beliefs down others’ throats.” I think, at this juncture, it’s helpful to remember what Jesus did with his own body. In the words of the Inclusive Bible, “The Word became flesh and stayed for a little while among us.” I love that unfamiliar phrasing—“stayed for a little while.” That’s the miracle of the incarnation! We all have but a little while on this earth—it never seems enough. Through Jesus, God knew us—what it was like to be us. And likewise, we use our bodies to know God. Eating, for example. Symbolically taking God in through eating and drinking. Later in the service, we’ll practice the sacrament of Communion. However you understand it, the liturgy always draws us to bodies—Christ’s body, broken out of love for us, and our own wounded selves—hungering and thirsting for God’s nourishment. In other words, there’s no shoving or force-feeding going on. There’s only an open invitation to be fed. The best kind of invitations are made generously, without expectations or contingencies. That’s the kind of invitation that was extended to me, when I gave a blessing at my friend’s Hindu-Christian wedding. They entrusted me with their sacred words, even if I didn’t understand them perfectly. What fullness of spirit, from which is drawn gift on top of gift! When we share the “Good News” of our faith, let us be clear: we are not forcing our epiphanies on anyone else. That’s impossible. True epiphanies are deeply-felt sensations—they are right and true and cannot be imposed from the outside. And that’s how it should be. Instead, when we evangelize, let us say this: come, eat at this table with us. Share in the conversation. Let me tell you what this meal means to me. And then, please, tell me what it might mean to you.